One thing I love about visiting the Mosaic District is the calm, cheerful vibe that the shops and restaurants have here. 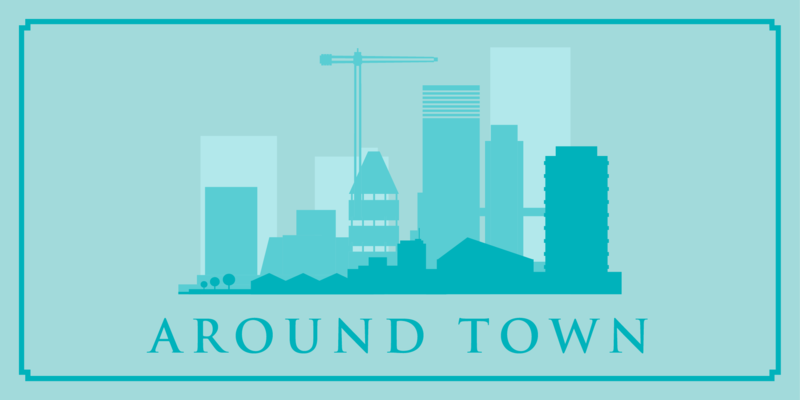 These businesses seem to share a pioneering, entrepreneurial spirit, which may be one of the reasons chef John Critchley and oyster farmer Travis Croxton opened a seafood-centric restaurant on this corner lot between District Avenue and Merrifield Town Center Drive. 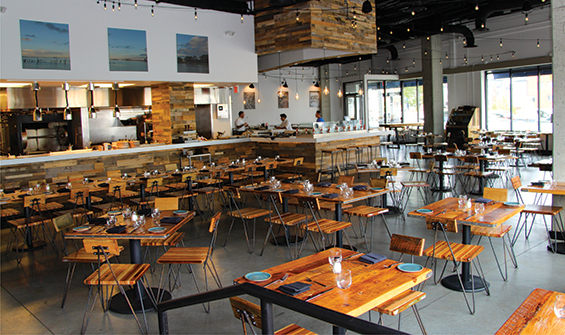 The restaurant’s sleek grey walls and floors are an ideal palette on which to contrast Brine’s rustic wooden tables, ice-covered raw bar, and vivid open kitchen. 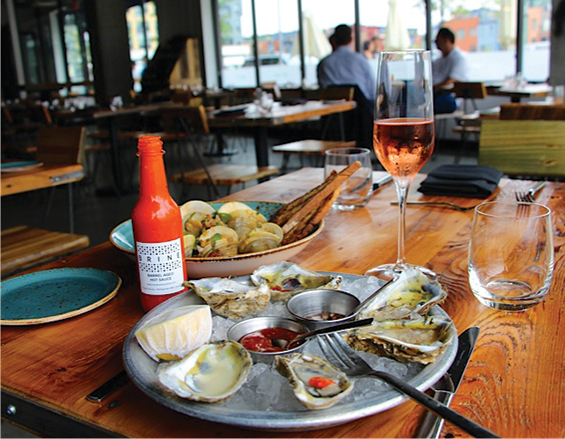 Brine may be known for their raw bar, which displays the daily collection of locally sourced Chesapeake oysters, but the restaurant also features dishes prepared on a wood-burning rotisserie. These dishes change depending on what Autumn Olive Farm in the Shenandoah Valley, happens to supply the restaurant that week. Pork, lamb, duck and chicken all take a turn on the grill. Every piece of meat I sampled at Brine had the unmistakable high quality texture of artisan meats raised in optimal conditions. You may think this doesn’t matter, but if you’ve tasted heritage meat side-by-side with the typical grocery store meat, you can tell the difference. Brine’s chef de cuisine Jim Diecchio has a resume guaranteed to impress any local foodie—he’s cooked at Zaytinya, Vermillion and Iron Gate. Before that he earned his seafood chops at Monterey Bay Fish House in Pittsburgh. This was all after college, but Diecchio actually grew up in Manassas, so he’s close to home now. Diecchio’s love for and knowledge of oysters is expanding while working with Travis Croxton, co-owner of Rappahannock Oyster Company, an oyster farming operation on the Eastern Shore of Virginia; and with partner John Critchley, the executive chef, who contributes his award-winning expertise in sustainability to this dream team. Formerly executive chef at both Urbana Restaurant and Bourbon Steak, Critchley is passionate about showcasing the best of MidAtlantic cuisine from farm to fine dining. Oyster fans should get here early for Happy Hour (between 3-6:30 pm) when the bi-valves on the half shell are half price. 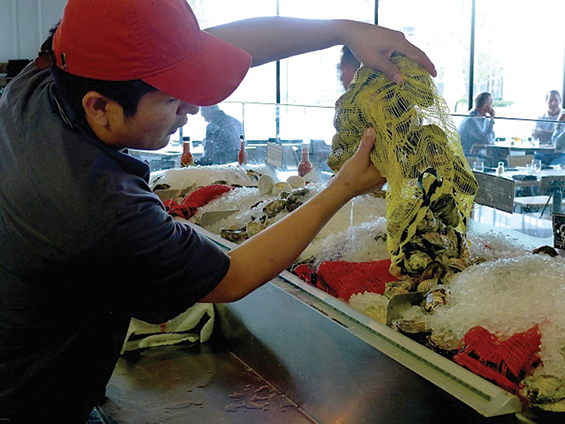 “We feature three oysters from the Chesapeake: Rappahannock, a good introductory oyster with a mild taste; Old Salt, which is heavy on the brine and salt; and Sting Ray, which is a combination of the two,” explains Diecchio. They also circulate their oyster selection with additions from the American northeast, like Pemaquid from Maine and Salt Pond from Rhode Island. Oysters at Brine arrive on a bed of ice, with Brine’s signature cocktail sauce and mignonette—a vinegar based sauce with garlic, shallots and ginger. These sauces elevate the distinct flavor of the oysters without overpowering them. Oysters are native to the Chesapeake Bay, in fact, Chesapeake means “great shellfish bay” in the language of the Algonquin Indians. Croxton and his brother employ ecologically sound aquaculture methods to harvest oysters at their farm in Topping, Virginia. They also own a clam farm in Chincoteague. Read more about the Rappahannock Oyster Company’s farming techniques on rroysters.com. It’s an inspiring story. Dig deeper into Brine’s menu, and you will find cooked dishes that are not to be missed. 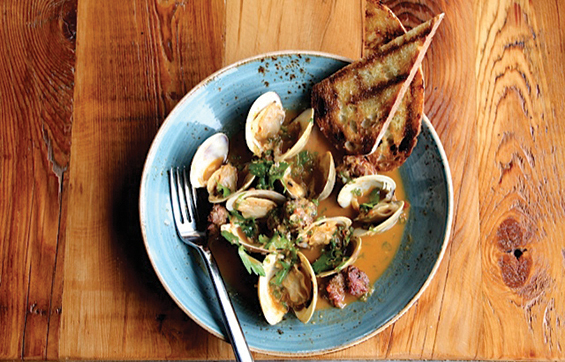 One of their most popular is the Lambs & Clams, a sultry combination of house made Merquez sausage and clams, sprinkled with cilantro and spring onions, swimming in a seafood stock heated by Harissa. The clams are firm and fresh, and the Merquez is a well-spiced ball of meaty goodness. It’s served with crunchy toasted bread to soak up all that luscious broth. 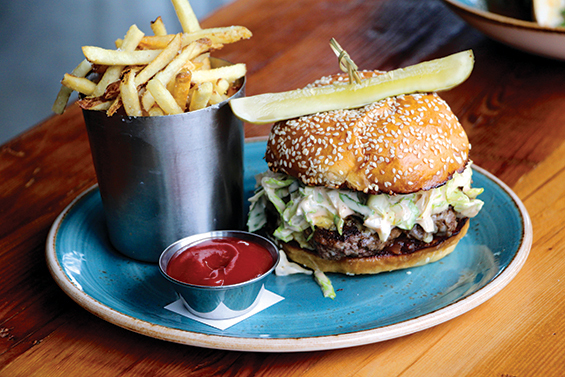 Recently, Brine was awarded Best Burger in the Neighborhood, and I’m not surprised. The patty is constructed out of the highest quality beef, grilled perfectly, then placed on a sesame roll, with a spread of sweet red onion jam, farmhouse cheese, and topped with chopped lettuce in Brine’s secret sauce. It’s a mouthful! The burger comes with the crispiest French fries—tiny hand cut beauties with specks of potato skin, shaken with sea salt. No grease, only a hearty portion of potatoes that taste extra good dipped into Brine’s handmade hot sauce. Diecchio tells me that Brine’s hot sauce is made from Fresno chili peppers aged in bourbon barrels. It reminds me of a refined buffalo sauce. I loved it enough to take one home; they sell bottles in the restaurant. Brine is true to its mission to support local growers by serving 20 local beers and ciders from Virginia craft breweries and cideries. The Brine team includes expert mixologist Jo-Jo Valenzuela, Brine’s beverage director, who has won more than a dozen bartender contests throughout the DC Area, including the “Elixir of Love” championship from Washington City Paper. End your meal with something sweet. 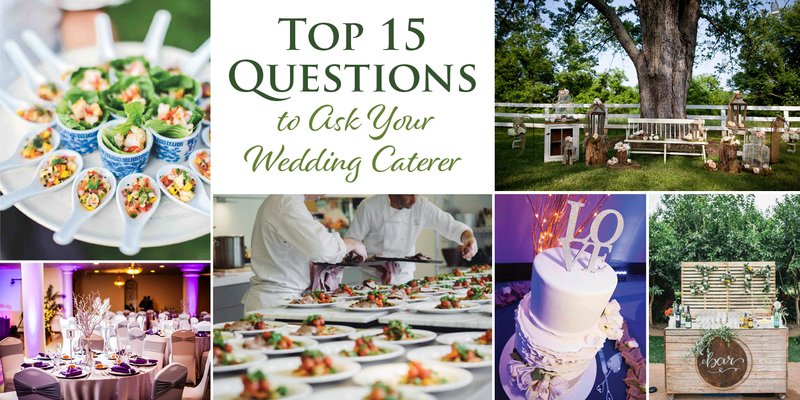 Along with graduating from the prestigious Culinary Institute of New York, Critchley is also a trained pastry chef. His fall dessert debuted recently, and it’s a stunner: a Riesling poached pear, cinnamon ice cream, pain d’epice and sea salt caramel gelato. I saw those freshly peeled pears swimming in a bowl of Riesling and fresh herbs, and then I was sad…because I didn’t have room for dessert! It looks like 2015 is shaping up to be a great year for the restaurant obsessed. 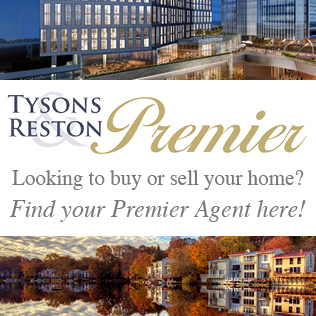 Northern Virginia scores another standout restaurant!